Cacio e Pepe (Cacio is ‘cheese’ in some Italian dialects, while pepe is simply ‘pepper’), is one of the simplest pasta dishes you can whip up. It consists of spaghetti, and a ‘sauce’ that comes together using freshly cracked pepper, pecorino Romano and lightly salted pasta water. 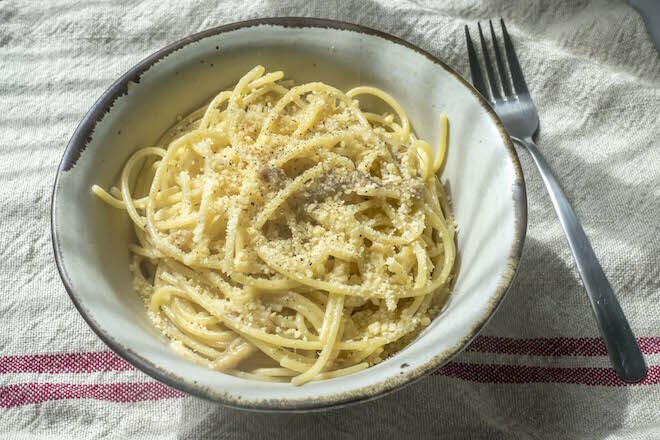 The recipe for Cacio e Pepe is said to have been handed down by shepherds from old Lazio (province of Rome) and Abruzzo. The trick according to its traditional origins is not to strain the pasta too much. In fact, Cacio e Pepe actually requires a bit of boiling salted pasta water (from the spaghetti) to melt down the cheese and pepper. The ethics of making a ‘real’ Cacio e Pepe still sparks much debate and outrage amongst Italians. 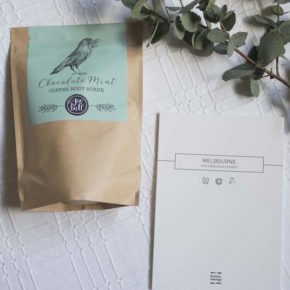 The purists stick to the traditional ingredients previously mentioned, and contest that the pepper must be freshly cracked and granule-y – some even grind it by hand. 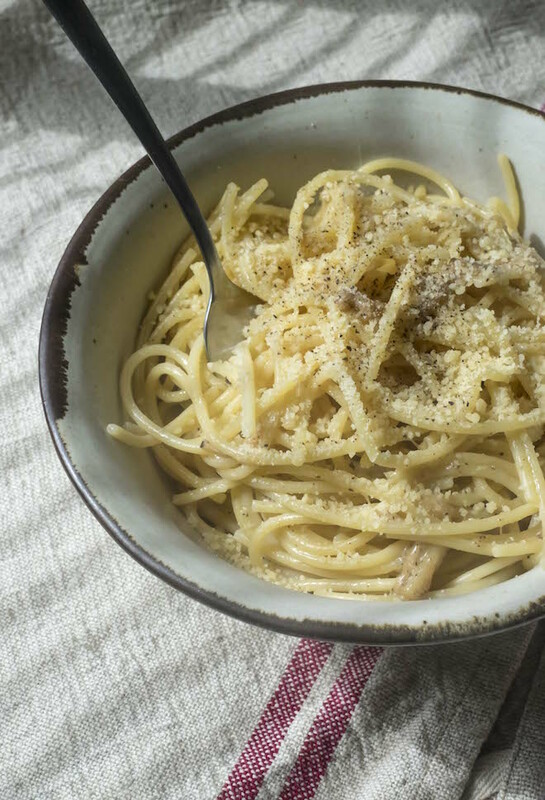 While others completely change the structure of Cacio e Pepe by adding olive oil, butter, mixing cheeses and even adding cream or egg to the mix – to the horror of the purists! Different techniques also apply when making the dish. For example, some people say that you must toast the pepper in a frying pan, then mix it with the cooked pasta mixing the pasta water and cheese together there. While others, mix all the ingredients in a bowl. I have tried most techniques and the best method seems to be the mix-in-bowl version, where the cheese emulsifies better and doesn’t stick or clump as it does in the pan. Here is my version below, a simple but satisfying ‘spaghettata’ of Cacio e Pepe that the purists shouldn’t be too horrified by. The best part is you’ll be eating it in about 20 minutes! Note that Cacio e Pepe is a simple dish, it’s best eaten when you are short on time but starving. Add a final sprinkling of cheese and a few cracks of pepper to serve and enjoy immediately! Note: Try to add as little pasta water as possible, and ensure you add the cheese and pepper mix bit by bit rather than all at once to control the consistency of the ‘sauce’.